Trying to decide what your next outdoor living project will be for this summer? Consider a concrete patio! Concrete patios are a great addition to any backyard and any outdoor living setup. Whether you’re just getting started on your outdoor living setup and looking to expand it over the next few years, or if you’re looking for the perfect finishing touch, a concrete patio is the ideal addition. Learn why you should install a concrete patio this summer in our blog! They’re a great way to begin an outdoor living setup. If you’re looking to add a focal point to your backyard, there’s no better place to start than with a concrete patio. You can customize them any way you want! From texture to color to pattern and design, you have complete creative control over your concrete patio. Choose stamped concrete if you’re looking to imitate the look of stone, or choose pavers for an understated but beautiful patio design. Generally speaking, patios are almost always cheaper than a comparable deck. Stamped concrete gives you the opportunity to imitate practically any kind of stone at a much more affordable price. They add livable space to your backyard. Patios are ideal for hosting events like cookouts with neighbors, friends, and family. Or, spend a relaxing evening outside on the patio with your spouse! Whether you’re entertaining a big group or just yourself, patios are great for any entertaining purposes. With proper care, concrete patios will bring you many years of enjoyment. Patios require very little maintenance. An occasional spray with the hose, as well as a yearly sealing, should be all you need to keep your concrete patio just as beautiful as it was the day it was installed. If you’re looking to sell your home in the near future, it’s important to think about your new concrete patio in the context of the sale. 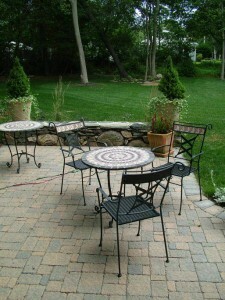 Adding a patio adds value to your home and makes it more attractive to buyers. This entry was posted on Friday, May 29th, 2015	at 4:39 pm	. You can follow any responses to this entry through the RSS 2.0	feed. Both comments and pings are currently closed.